See you at the Big Horn Show – The Big Horn Show runs from Thursday, March 16, through Sunday March 19th this year. For those who are new to the club or those who have only recently started tying, make sure you visit our booth. This show is a great opportunity for our club to share our tying and fishing knowledge with young and older folks and we encourage those not volunteering to come by, try a little tying yourself and support those tyers signed up to teach. We will not have the tying theater this year but will instead have a corner booth that will allow for two tyers for the whole show to help teach the kids plus a demo tyer during the higher volume attendance times. 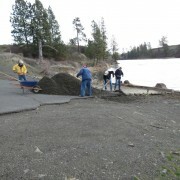 On Wednesday morning, February 24th, a work crew showed up at Amber Lake to rehabilitate the launch area. There were four IEFFC volunteers (Jerry McBride, Lee Funkhouser, Tom Hoag and Jim Athearn) and four from the Spokane Fly Fishers Club. The project was supervised by Daniel Dzeikan of the Washington Department of Fish and Wildlife. The project was completed on Friday with Stephen Aspinwall joining our IEFFC group for that final day. The project included spreading gravel on both sides of the launch. 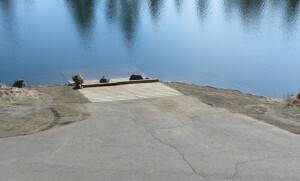 A boat launch area was created on the left side of the concrete ramp and the pontoon and float tube launch area to the right was smoothed for better access. After we are done, WDFW will have someone come in with heavy equipment and put the larger rocks in place. The boulders blocking the concrete ramp will be moved in front of the concrete slabs and a fourth boulder will be added to completely block off the ramp. They will also place boulders along the right side of the concrete ramp over to where the shoreline drops off. There will be gaps for the tubers to have access but they will block boat trailers on that side. This will eliminate the past problem with trucks spinning wheels and eroding out all the new gravel trying to pull boats up the steeper slope. The ramp should be ready for the 1 March opener. The first day consisted on spreading the first load of gravel over the areas closest to the concrete slab. Our hard working volunteers then showed up bright and early Friday morning to finish the project. With a second load of gravel, we were able to finish off the new trailer launch site on the left of the concrete ramp and fill in the area to the right of the concrete ramp that has been severely eroded over the years. The new ramp for the boat trailers has a less severe slope and should be easier for launching boats. 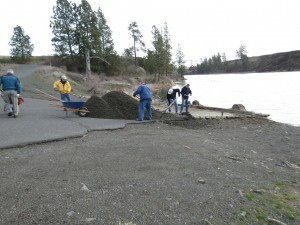 We also cleaned up the concrete ramp so it will be good for staging by all anglers. The boulders we had hoped to be placed around the area reserved for tubers and pontoon boats will not, unfortunately, be delivered until next Thursday or Friday at the earliest (soonest the haulers were available). Daniel Dzieken (WDFW person responsible for ramp maintenance) will post signs and put up a temporary barrier explaining that the ramp is still “under repair” and where boat trailers and tubers should launch. Hopefully everyone will respect the signs and not try to launch trailered boats on the right side where they have done so in the past. The gravel on that side is loose enough that vehicles will likely sink in and either get stuck or just damage the area by digging ruts. I think the ramp is in the best shape that it has been in for many years. All of the anglers in the region will benefit from the efforts of the Inland Empire Fly Fishing Club and the Spokane Fly Fishers. Submitted by Jim Athearn – IEFFC Projects Chairman. 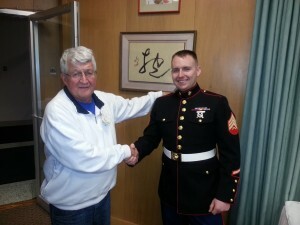 The Toys For Tots campaign was again a huge success with hundreds of dollars donated as well as two large boxes of toys. 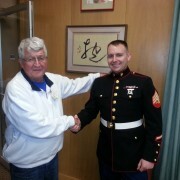 Visiting we had representatives from the United States Marines and they spent a lot of time talking to members and expressing their appreciation for our donations. Your help in this program will allow more children to enjoy the Christmas holiday. Thank you all for your generous donations!! !